The waters of Lake Titicaca turned to green and brown and the fish are scarce, mainly due to the pollution that is currently caused by product of waste water. According to Minagri, actions will be promoted to decontaminate the whole Lake Titicaca between Peru and Bolivia, with the construction of treatment plants in towns and cities, to avoid waste water ending up in Lake Titicaca and Desaguadero River. Both Peru and Bolivia contaminated. The city of Alto La Paz in Bolivia, with a population of one million 184 thousand 942 inhabitants is the major polluter at present. Almost half of the waste of the city is getting directly into the lake, while the other part is processed by the treatment plant Puchukollo. The Puno region in Peru, which concentrates its inhabitants into a single point, also discharges its waste into Lake Titicaca. Copacabana has become one of the most polluted with Tiquina points and Cohana. Waste of its growing population and its many visitors go straight into the lake. 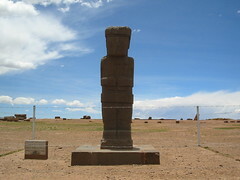 In the religion of the Incas, it was believed that the sun god was born here. And with reason. The Isla del Sol is beatifully positioned in the Bolivian side of the Lake Titicaca. Left the Lake Titicaca and Isla del Sol, in the direction of La Paz, the Tiwanaku unesco site lies in the middle of the andean highlands, surrounded by semi-desertic landscape and dominated by some of the highest and most magnificient andean peaks (Janq’u Uma, Illampu, Huayna Potosi, Illimani). The site is worldwide famous for being the inauguration speeches of Evo Morales, in front of the gateway of the sun and for being a highly spiritual place, representing the vision of a world centered on the tradition and matriarcal social footprint of the indigenous peoples. Lake Titicaca is breathtaking for its extreme beauty and not only for the altitude of over 3800 meters above sea level. From Ayacucho, an endless journey that leads first on the coast of the Pacific Ocean in Pisco, Ica and Nazca, Arequipa and finally the return to the Andean plateau, between Juliaca and Juli, two villages on the shores of Lake Titicaca. Along the lake you can discover enchanted places, breathtaking views and an ancient culture that has its roots in symbiosis with the lake Titicaca. On the horizon you can see some Uros settlements, built on islands made of cane and that can be reached with the typical canoes also made of cane. 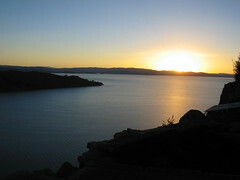 A sunset on Lake Titicaca is worth a trip. Soon it will be Bolivia.